This movie I saw on Netflix and it’s based on some book but the movie kind of strays from the book. Starts off with some guy and his family and when they get in some big traffic jam. A bit later the guy leaves and calls his UN friend to pick him up from a building. These zombies show up and they look okay and there isn’t much gore since the movie is PG-13. The guy gets bit but has some immunity to them biting him. Also he adopts a little boy since his family gets attacked from the zombies. The UN people pick up the guy and his family just as the zombies flood the building. 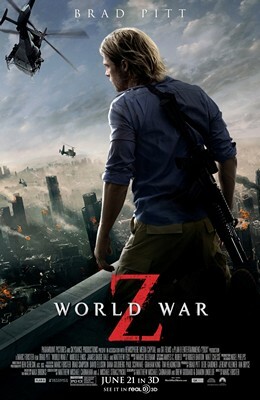 Some of the visuals in the movie can be good, see the zombies work at a citywide scale. The UN people drop the guys family off at a military boat where the guy later goes on a mission with some people to I think Korea. There was also this one scientist guy from the boat that seems to be built up and then his final scene seems like a cop out. Then for some reason they regroup at Jerusalem where the zombies then try to pile up on the walls of the city and seeing the city fall down is a little shocking. The guy then gets on a plane with a bunch of people and they take off. Things seem to be safe until a zombie hid on board and infect practically everyone and destroys the plane. The guy and some girl make it to the center of disease control where we also see a pre Doctor Who Peter Capaldi. The guy explains to Peter about finding a disease that can mask people from the zombies. Peter then tells them that the diseases room became infected so the guy and some people go to the room. There also this scene where the guy tries some viruses but doesn’t know which one and that scene was parodied in Robot Chicken. The movie from what I heard had a bit of a racist overtone but it just seems like an okay zombie movie. The ending also seems a little too Hollywood for a zombie movie to. There’s also an uncut version but there probably isn’t any gore in it still.